In January, I will be officially self-employed for two years. It’s truly been an incredible journey and one I don’t regret whatsoever. I’m not alone. According to the Pew Research Center, 3 out of every 10 people are now self-employed, which means that a significant number of people have seen the benefits of quitting their job and working for themselves. However, becoming self-employed is not a decision you should make lightly. In fact, I waited until I had six months of solid freelance income that surpassed my full-time job’s income before taking the leap. Now I make more than double the amount I made at my full-time job each month, and I expect the number to rise as I continue to work in the future. As anyone who is self-employed will tell you, the hardest part is not knowing how much money you’re going to make each month. The income is truly variable, no matter how steady your list of clients is. I’ve actually had my highest income month ever followed by my lowest income month ever before, and because unexpected things happen, an emergency fund is key. To take it a step further, it is wise to have separate business and personal emergency funds, likely in separate savings accounts. Synchrony Bank is a good bank for this as they have no minimum balance requirement and pay 1.85%. You should have a personal emergency fund to cover issues like car repairs and health issues and a business emergency fund to cover you if you lose a client or when a check is late. I’ve always felt that health insurance is extremely important, and it’s worth paying for quality insurance. Finding that insurance requires exploring your options and comparing rates at commercial sites like EHealthInsurance as well as at your state’s online Health Exchange. My husband and I have to pay for our health insurance ourselves, and it runs us about $8,000 per year. Luckily, in the future, his work should cover our insurance but if you are single or you don’t have a spouse who can get insurance through their work, you really need to take the time to read through all of your options. You should not quit your job until you’ve priced and considered all options for health insurance and know what you’re going to do to protect your family. I talk to people all the time who just hate their jobs and want to quit. They’re tired of the rat race, of the commute, and the ungrateful co-workers who take their ideas or talk over them in meetings. While I can completely understand that many work environments are challenging, this is not a good enough reason to just quit. You need to have a solid backup plan, preferably a thriving side business so that you can immediately leap into self-employment and make an income. There has been some pretty strong debate in the past over which type of job is more secure – one where you work for yourself or one where you work your way up in a company with a steady paycheck. Given the ever changing economic climate, many people have found that working for yourself is the only real way to guarantee yourself a job in the future. However, that doesn’t always mean that your income is guaranteed to come on the same day every month. Many people feel safer knowing they are a valued employee at their job and like knowing how much their check will be every month. If this is you, self-employment might not be the best fit. I’m not going to lie. One of the best perks of working for a company is the potential for a 401(k) match. Sure not every work place offers something like this, but if yours does, it can be difficult to walk away from such a lucrative benefit that gives you free money. A retirement match could be a strong reason to stay, but everyone I know who is self-employed has been able to generate more income than they did at their day job, which means you can invest even more than you did before. 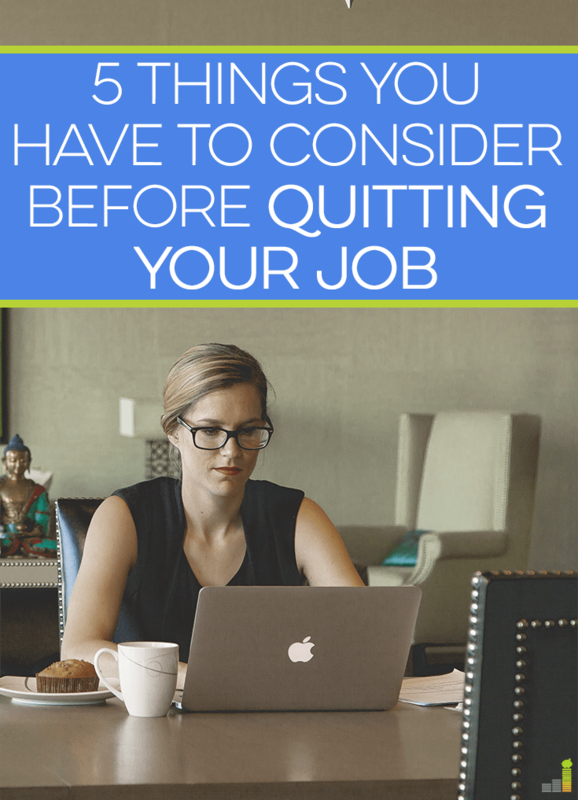 Ultimately, quitting your job is a huge decision, one of the biggest you will ever make. So, even if you are fed up with your work, bored, or just craving the opportunity to make a bigger difference, know that it’s definitely possible to quit and work for yourself, but you absolutely need a plan. Take the time to do it right by saving an emergency fund and researching your insurance and retirement options and you’ll go into the decision much more knowledgeable and ready for your new future. What would need to be on your list for you to walk away from your day job? What’s the biggest benefit to being self-employed, in your opinion? What would be the hardest thing for you to give up about your current job? I currently work as a real estate agent and build online projects on the side. The online projects are to help create multiple streams of income to offset the roller coaster of real estate commissions. Having an emergency fund properly built is crucial. You have to be very lean when starting out to get to a safe place where you’re not worrying about where your next house payment is coming from. I still struggle with this as I am paying off student loans at the same time, but I’ve been a full time agent for 5 years now so I’ve adjusted. The best part of doing this is the freedom to do whatever I want during the day. It can be lonely at times, but that’s why I make sure to go to the gym, make plans with friends, etc. I hope to never have to do the 9-5 again. That’s very cool – a fellow hustler! Giving up the stability of a paycheck that I know is coming as well as my good work/life balance would be two things that would be very difficult to give up. These are great suggestions and thought starters for those who are thinking of taking the leap! Yes I have no work/live balance. I prefer to call it a blend, haha. The lines are very muddled but I’m still happy with the choice! Agree with health insurance & type of work. Health insurance is our biggest expense after a mortgage & our rates just went up for the upcoming year closer to $500/month. Also for leaving your current job, if you don’t have a solid plan in place, you might end up back at minimum wage for a little bit, working all those crazy hours for a whole lot less. That’s true. A plan really is everything!! Wonderful article!! 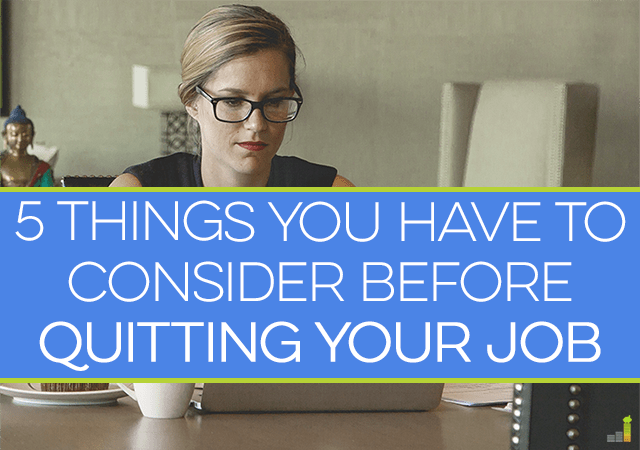 All of these things need to be taken seriously before quitting your job. For me, I enjoy having a flexible lifestyle. I both work FT (partly from home) and I freelance and blog. It’s the perfect mix of being in an office and having my freedom. Who knows what the future holds, but if I were ever to quit my job you can bet my freelancing income would be matching it at the very least!! I do too as you know!! 🙂 Flexibility is the best esp when you’re a parent! Health insurance is a HUGE factor when deciding to become self employed. I feel so fortunate that my hubby has a “regular” job that has great health insurance for our family otherwise we would have some even more difficult decisions to make as I pursued my career. Yes I can’t wait until the hubs’ job pays for this next year. I’m so tired of spending so much money on it! I work in government so the toughest thing for me to give up are the benefits. Health insurance and the pension. Oh the pension is like a golden handcuff…very few jobs offer pensions nowadays. I worked in the Park Service before starting the blog so I totally understand! I just recently did this! Left a lucrative 20+ year career in the financial services industry to go independent. I think these tips are right on and at some point – if you feel it – you should do it. I found myself waffling on the fence for years (literally) until a health issue made me reassess and take the leap. And now I wish I had done it sooner! My income isn’t where it was yet, BUT it is better than I expected at this point (less than 3 months in) and growing. The biggest surprise to me is how many opportunities there are to make money outside of a rigid 9-5pm. Great article, and very timely for me!